Every day during the month of October I posted a Down syndrome fact on my Facebook page. Here are 31 facts about Down syndrome. Want the 31 Facts About Down Syndrome as a PDF? Click this button! 1. People with Down syndrome have 47 chromosomes instead of the typical 46. How does it happen? There is an extra copy of the 21st chromosome. 2. Down syndrome is not an illness or disease (you can’t catch it), it is a genetic condition caused by the presence of an extra 21st chromosome. What else is determined by your genetic makeup? The color of your eyes, the color of your hair, or how tall you are. 3. It is Down syndrome, not Downs, and people have Down syndrome they are not Down syndrome. Don’t say, “Nichole is Downs” say, “Nichole has Down syndrome.” Down syndrome does not define individuals, it is simply a part of who they are. 4. People don’t have “mild” Down syndrome, or “severe” Down syndrome. Ability is not dependent on the condition, but rather the individual. People either have Down syndrome or they don’t. 5. Contrary to popular belief, people with Down syndrome are not always happy. They experience every emotion you and I do. Trust me. 6. 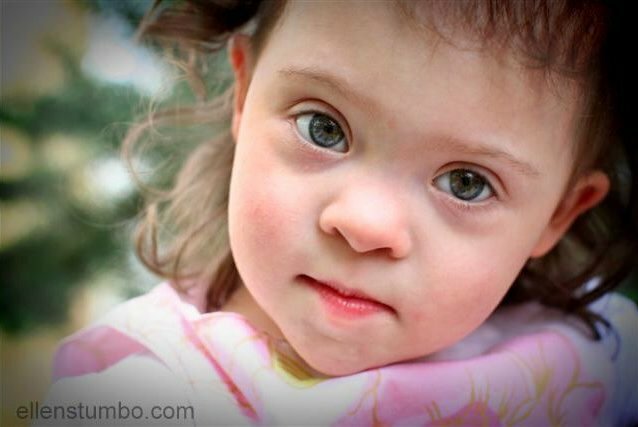 Children with Down syndrome go through the same stages of development as typical children do. The difference? Compared to their peers, it takes kids with Down syndrome longer to achieve milestones. Things like rolling over, sitting, crawling, walking, talking, etc. 8. A person’s facial features do not determine cognitive ability. Just because someone has many of the characteristic physical feature of Down syndrome does not mean they have a lower IQ. Just because someone has soft features of Down syndrome does not mean their IQ is higher. 9. You will get what you expect! Just because a child has Down syndrome it does not mean they are unable to be well behaved or follow directions. Kids with Down syndrome are smart, it takes them a few minutes to recognize expectations, and you will be manipulated to the best of their ability. Trust me. 10. There are three types of Down syndrome. T21 (or non-disjunction) is the most common. All cells have an extra chromosome. Translocation Down syndrome, when part of chromosome 21 becomes attached (translocated) onto another chromosome. Children with translocation Down syndrome have the usual two copies of chromosome 21, but they also have additional material from chromosome 21 attached to the translocated chromosome. Mosaic Down syndrome, where only some cells have an extra chromosome, but other cells in the body are typical. 12. Not all kids/people with Down syndrome are the same. Knowing one person with Down syndrome, does not mean that all people with Down syndrome are the same. We are all individuals, all of us, regardless of how many chromosomes we have. 13. People with Down syndrome are beautiful. 14. When my daughter was born, several people offered comfort by saying, “She will never know she is different.” Here is a fact, most older kids and adults with Down syndrome are aware they have Down syndrome. Once, a young woman with Down syndrome upon meeting my daughter said, “Your daughter has Down syndrome like me because we have an extra chromosome, it’s chromosome 21. It makes some things are harder for us, like…” Yeah, she rocked the extra chromosome! 15. Adults with Down syndrome are nor “perpetual children,” they are adults, and they happen to have Down syndrome. 16. Kids with Down syndrome do best in an inclusive learning environment, and typical kids do best when they learn about diversity, kindness, and friendship at an early age. Inclusive classrooms teach and benefit all kids. Want the 31 Facts About Down Syndrome as a PDF? Click this link! 17. People with Down syndrome contribute to their families, their schools, their coworkers, their employers, and society. 19. Many adults with Down syndrome attend college, have jobs, or marry. 20. People don’t “suffer” from Down syndrome. In a study conducted by Brian Skotko, 99% of adults with Down syndrome reported they were happy with their lives. 21. In Brian Skotko study, only 5% of parents reported feeling embarrassed by their child with Down syndrome. 22. If someone you know has a baby born with Down syndrome, say “Congratulations on the birth of your baby!” All life is worth celebrating. 23. Adults with Down syndrome do not live with their parents forever. Many live independently and thrive. 24. Kids and adults with Down syndrome are aware of how people perceive them, and they care. They get their feelings hurt, just like you and I do. 25. People with Down syndrome have hopes and dreams. They too want to make a difference in this world (and they do). 26. One of the most significant challenges for people with Down syndrome is low muscle tone. Low muscle tone affects speech, gross motor skills, and fine motor skills. Speech, physical, and occupational therapy help. 27. The word “r*t*rd*d” is offensive, it hurts. People with Down syndrome deserve respect. 28. Kids and adults with Down syndrome have much to say. They have thoughts, ideas, and enjoy meaningful conversations. Take the time to listen and be a friend to someone with Down syndrome! 29. Fifty years ago, parents were still encouraged to send their babies born with Down syndrome to mental institutions. That was not too long ago. What you see now is the hard work and determination of parents willing to fight the battle for their children, and for the many that have followed. We have come a long way, as my daughter now sits in a classroom where she is fully included…and accepted. This is worth celebrating! 30. Down syndrome is the most common genetic condition. One in every 691 babies is born with Down syndrome in the United States. 31. Most families are living and loving life with Down syndrome. If you don’t know someone with Down syndrome, you are missing out. Thank you for putting all these together in one place, and adding from a mother’s perspective. I’d like to share this on my blog. Hi, Ms. Stumbo, my name is Coretta, i live in Guyana, South America. i gave birth to twins, boy and girl. honestly, my son to everyone was the strongest, because he showed no signs of being down syndrome at that point, even the doctors told us nothing, when they checked on him, everything was okay, we went to a private doctor, after myself and cousin notice the shape of his eyes, and we were told then that he has down syndrome, i blanked out, even though the demonstration showing her my daughter would stiffen her limbs, while my son just let them loose. i was confused, im young,i was only twenty three when i give birth, i though only older women got babies with down syndrome, i blamed myself. may be my eggs weren’t good, i don’t know. He turned before her, cooed before her, how can he have down syndrome, while she is normal and he is doing these things he is not suppose to do before her? these were the questions i asked myself, his head is not flat, his ears are not turned down, they are normal, but he has the almond eyes, he didnt have brushfield spots, he has the same amount of lines in his hands as me, he reacts in danger, there is so much that he does that he is not suppose to, but he gets sick easily, his motor skills are slow, but not below average kids, everything he does, his within normal range for some kids that are perceived as normal… im confused! I’ve research mosaic down syndrome, is this what he has, because he does everything a child without down syndrome does, he even battles with his sister, he is strong, as in physically… i dont know there is so much more, help me to understand please, help me to know how to go about making him into the man i want him to be, help. please note: i do wish to imply anything when saying ‘not normal and normal’, i am just saying everything as to how it was told to me by the doctor. Coretta, did they do a genetic test? Having a diagnosis just based on the shape of his eyes and low muscle tone is not an accurate diagnosis. If he does have Down syndrome, a genetic test should tell you if he has regular Down syndrome or mosaic Down syndrome. But, do remember that physical appearance is not what determines ability. Whatever type it is, keep expecting much from him, the sky is the limit! I work with a young woman in our high school life skill’s class. She makes me LOVE my job. I get hugs and I try to avoid her kisses but I don’t always achieve that:) She tells me she loves me numerous times a day. She’s very strong-willed but she’s had to be – pretty rough home life. She is amazing, infuriating, loving, a faithful friend, sensitive…did I say infuriating? But most of all, she makes my heart sing. Oh Laury yes! I love it! Very nice points! Enjoyed it! Remember, in the UK, Australia and most of Europe, the accepted and correct term is “Down’s Syndrome”, while in the US it’s “Down syndrome”. Thanks! Nikki, yes, you are absolutely right! Thanks for pointing this out! Thank you for contributing to my ongoing education about Down syndrome. Most enlightening! Thank you for your willingness to hang around and learn Peter! Hello! Thank you for writing this very informative article. I am 13 years old. My brother just learned that his girlfriend is pregnant. She was told the baby would have down-syndrome. I don’t know what to do or how to feel! I am so excited! But i am nervous for the bullying and discrimination she will get. Any advice for being the aunt of a baby with down-syndrome? When my daughter was born with Down Syndrome I feared she would be bullied and teased, but you know what? She’s like a rock star at her school. Everyone knows her and wants to play with her at recess. I think in many schools the atmosphere has changed because many kids with disabilities are mainstreamed, so other kids learn that kids with differences are really just like them in most ways. Don’t worried about your niece being bullied. Just love her and let her know how special she is and she will grow up with self-confidence. My older brother, age 42, has Down’s syndrome. # 18 in your list brought tears to my eyes as he has truly been a gift and light in my life. He is everything to my parents and sister and I, and has defined our family’s close connection. It was suggested when he was born he be institutionalized and of course my mother wouldn’t hear of it. I can’t even imagine my life without his presence, his lessons and his love. It’s the best. And know I have a new baby nephew with downs. The world of possibilities has broadened tremendously for him and I am happy for the progress. Thanks for great, truthful and positive posts like this! Natalie, thanks so much for sharing about your brother and how he has impacted your family! Im doing research because my best friend’s unborn baby girl has a 96% of posibilities of having Down Syndrom. She was told to abort because it is suppose to be hard. Well she said she didnt care but that those were not her plans! What is rhe most difficult thing about raising a child with down syndrome? How do you think i can help them? I have an 8 yr. Old son with down syndrome who is also autistic and i have to say the biggest and best blessing . he can be tough as nails or soft as cotton but i wouldnt change him if i could. he has given mt husband and i the greatest of gifts….the gift of being his parents.. Many thanks for your beautiful article. I recently learned of an initiative called “Brownies and Downies”, in which people with Down Syndrome are employed and trained at a coffee shop in a popular area. There are a few of these places around the world. I just wanted to know what you thought of the name? I personally find it offensive and would like to get your opinion. I don’t particularly love it either Kelly. I understand the play on words and rhyming, but I would have tried to come up with a different name. Have you heard of “Dreamers Coffee?” Similar idea, great name. I love this so much. I must share. My daughter is my world. And this really puts the facts out there. Ellen thanks for all you share. As a parent of twins daughters who unfortunately passed away years back, I really admire parent like you. Keeping doing and sharing the good work. What does the words perpetual children mean? Forever children, as if they never grow up. Great article. My older brother with Down Syndrome just turned 49 and I’m 44. It’s not always easy being the younger sibling because so much attention went to my brother and his development. As an adult, I understand the sacrifices my parents made and continue to make for my brother. Ive always treated my brother as a typical sibling inclusive of arguing, battling for attention, and of course love. But what I don’t like, is when people feel sorry for my brother. I always say to them, don’t feel sorry for him…he has a great life! Both my parents, 80 & 85, live with my bother and continue their daily ups and downs with certain learned behaviors, like how to manipulate my parents to get what he wants. And like any parent out there… If You let certain behaviors continue and get rewarded…reversals are hard. But as with any child, he knows not to try that stuff with me because I won’t give in. LOL. My brother is a healthy, honest, kind, a little selfish (a sibling thing????) human being with that extra chromosome. Parents out there, push your children with DS early, focus on their natural abilities, get them involved in sports, let them be kids, and whatever you do…don’t ever feel sorry for them…instead feel happy for their achievements. Hi, Maira, I just read your comment and I am a new mom who have an 11 month old baby boy born with Down syndrome, and we are raising him without limitations, he is a baby first down syndrome does not define him, when people ask and we tell them I say please do not feel sorry for him or us we are very focused on his strengths which he demonstrates to us. Love him to pieces! Hi dear, I have a 3 yrs baby son with Down Syndrome. His name is Saatvik. He can’t speak properly till now. My son is my life. I just wanted to know that is it possible for him to spend a normal life like other in future. Thanks so much for posting these wonderful facts about Down’s Syndrome and for creating this lovely space. My sister has Down’s Syndrome, and was recently diagnosed with having Alzheimer’s aged 50. It’s quite common among people with Down’s apparently, at around 30% according to findings at Cambridge University. Our family is of course very upset, and it’s made me realise recently what my sister has meant to me throughout my life. I’m ashamed to say that sometimes in my early life I felt embarrassed by my sister, it was an era when kids were cruel and I was teased at school about her. So your point about things changing in the last 50 years rings so completely true. My mum has made it her life’s work to push things forward for people with learning difficulties in society, and in our neighbourhood I regularly see a little 11 year old girl with Down’s walk to school on her own, happy as Larry and not out of place at all with the other kids going to school. It makes me smile inside and out. My sister has been (and still is) a light in my life, and I know has played a huge part in my very open heart, a very easy ability to empathise and accept people of all kinds. She is always loving, always ready with a hug and the simplicity of our relationship is a precious thing in often complicated adult life. I love her with all my heart and feel so lucky to be her sister. Ellen, I share many of the same comments that you have received. I have a younger brother that I am the sole caregiver for now that my parents have passed away. John and I have always been close and he is 55. He does not like to be old so he tells everyone that he is 25….He is the best thing in my life. No matter what happens he is always there for me. He is fun to be with and I can not picture my life with out him. The one thing that is difficult is you have to always fight for him. With all the goverment cut backs it is difficult financially to support all of his needs. But it is a fight I glad take on. When John was yonger I remember going with my mother to fight for John just to be able to go to school. Prop 2 1/2. Before that they did not have to go to school. So much has changed and I agree that you need to remember that Down Syndrome doen not define John it is just one part of him. He has an increable memory. He never forgets anything/anyone. Just alway remember that your child/brother/sister/friend is an individual with need and wants just like everyone else….If you do not treat them with respect they know it they are not dumb…..
Patricia, I love the voice of the siblings, thanks for sharing!